While middle-school is optimal for early preparation for those taking the SAT and ACT tests, an accelerated test prep, via a small group class or one-on-one, can make a huge difference and significantly boost a score in a short period of time. For those wondering about “the BEST time to start studying” for the SAT or ACT. If you are asking the question, the answer is likely… NOW! Some of our students begin as early as the 7th or 8th grade and focus on achieving a top score on one of the two tests; the SAT or ACT exam. Other students, study for the SAT for a year or more, take the test, and then immediately shift gears into a “crash course” that prepares them for the ACT. Ultimately it comes down to what your student wants to achieve. Because we begin with their learning style and current knowledge-base, and focus on aggressively strengthening areas of weakness, we always see great results. In our time working with Bay Area and Silicon Valley students, we have seen remarkable improvement in concentrated periods of time. When a student is highly motivated, and excited by the prospect of reaching that high score, impressive things can happen in a short amount of time. 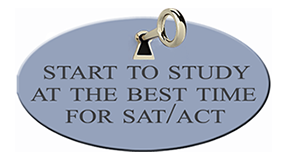 That said, it is best to view that as the exception to the rule and ideally, start SAT or ACT test prep as soon as possible. By beginning SAT or ACT test prep early, we have the time required to test, address all areas of concern until we reach an optimal score. The more proactive you are about test prep, the more likely your child will realize that “unachievable personal best” so many of our students aim to reach. It starts with personal assessment by appointment. Please call or email us to schedule a convenient time. Amy looked at Kate’s SAT test from October and figured out exactly which areas she needed the most help on. We really liked the weekly progress reports and the all of the assignments. And all of this hard work paid off: We just got Kate’s scores and she got 2400.